Exhibition: Yayoi Kusama: Pumpkins [London] | What can I do with a B.A. in Japanese Studies? 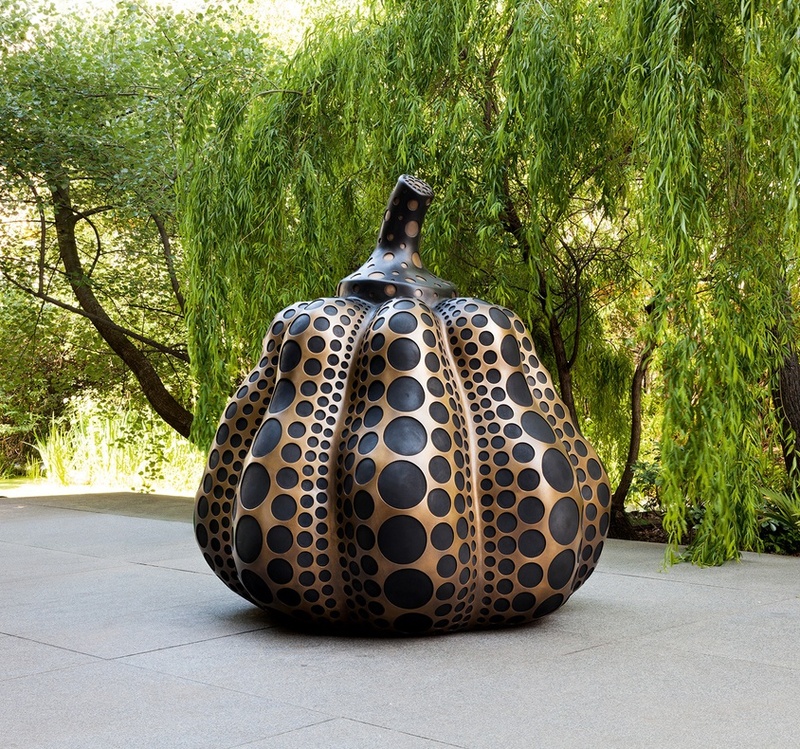 Victoria Miro is delighted to present a new body of sculptures and paintings by Japanese artist Yayoi Kusama dedicated to her iconic depiction of pumpkins. The exhibition, which opens on 16 September 2014 comprises two elements: the main gallery will house a new body of paintings and large scale mosaic pumpkins which will be on show until 4 October; whilst a major new series of bronze sculptures will be on display in the gallery’s unique water garden until 20 December. The bronze pumpkins have been two years in the making and mark the first time the artist has worked with bronze on such a large scale. The plant appears in some of her paintings and works on paper as early as 1948. After her return from New York to Japan in the 1970s she rediscovered the theme, and began making serial works depicting the pumpkin in various media: paintings; prints; sculpture; installation; and environmental works. She has made tiny pumpkins no bigger than a key ring, and monumental pumpkins that dwarf the viewer with their scale. She has placed pumpkins in box structures and in mirror rooms, and used the distinctive knobbly patterning of their skins as inspiration for her unique dot-patterned paintings and textiles. In 1993 pumpkins formed part of her presentation in the Japanese Pavilion at the Venice Biennale. In 1994 her iconic exterior sculpture of a large yellow and black pumpkin was sited at the Benesse Art Site Naoshima, an island in Japan’s inland sea dedicated to displaying art within nature. “‘Pumpkin head’ was an epithet used to disparage ugly, ignorant men, and the phrase ‘Put eyes and a nose on a pumpkin’ evoked a pudgy and unattractive woman. It seems that pumpkins do not inspire much respect. But I was enchanted by their charming and winsome form. What appealed to me most was the pumpkin’s generous unpretentiousness. That and its solid spiritual base” (Yayoi Kusama, Infinity Net: The Autobiography of Yayoi Kusama, trans. Ralph McCarthy, London 2011, p.76). This entry was posted in announcements, culture, events and tagged art, bronze, exhibition, London, pumpkins, sculpture, Yayoi Kusama. Bookmark the permalink. I love it! Just in time for fall and Halloween 🙂 You should see some of Yayoi Kusama’s older installations. They’re crazy!